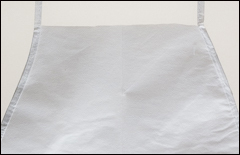 Aprons, disposable aprons, splash protection, disposable protective clothing, chemical resistant clothing, disposable garments, personal protective clothing. 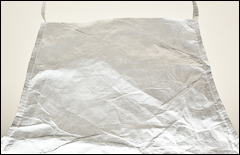 Photographs of SBPP, PosiWear BA, and Tyvek fabrics are shown on our Coveralls page. Other protective clothing is shown on our Coveralls , Shirts, pants , Shop coats , Sleeves, shoe covers , and Sweatbands, hoods pages. 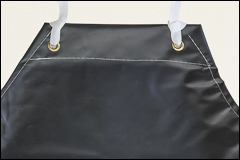 Polyethylene coated polypropylene enhances protection by providing non- hazardous liquid, light spray, and particulate protection. White aprons with attached neck and ties. Sold by the case, 100/case. Microporous material that resists small dry particulates and liquid spray. Provides a high level of protection against non-hazardous dry particulates, light sprays and liquid splash. Passes US and European standards for liquid barrier and bloodborne pathogens. White aprons with attached neck and ties. Sold by the case, 100/case. 100% high-density polyethylene fibers entangled into protective material with no fillers or thin films to wear away. Breathable protection against hazardous dry particles, aerosols and non-hazardous light liquid splash. Excellent abrasion resistance; protects against small-sized hazardous particles. White aprons with attached neck and ties. Sold by the case, 100/case. Apron with extra long ties and plastic grommets. Plain-edge style provides superior flexibility and resistance to chemicals, fats, oils, grease, punctures and abrasions, 18 mil thick. Sold by the dozen. 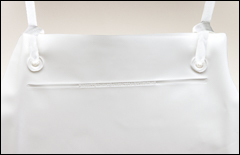 Apron is a nitrile coating on a cotton/polyester sheeting. Black, industrial grade, and chemical resistant. Brass grommets and tape tie strings. Turned and stitched edges. 18 mil thick. 12/case but sold in any quantity.